Ryobi are known to produce some of the best weed eaters on the market. Besides that, the company has expanded its innovation and this has seen them introduce a wide variety of heads. The three most common types of heads include the Pro Cut II string head, Reel Easy and the Universal Bump Feed. Each one of them has their unique re-stringing procedure. 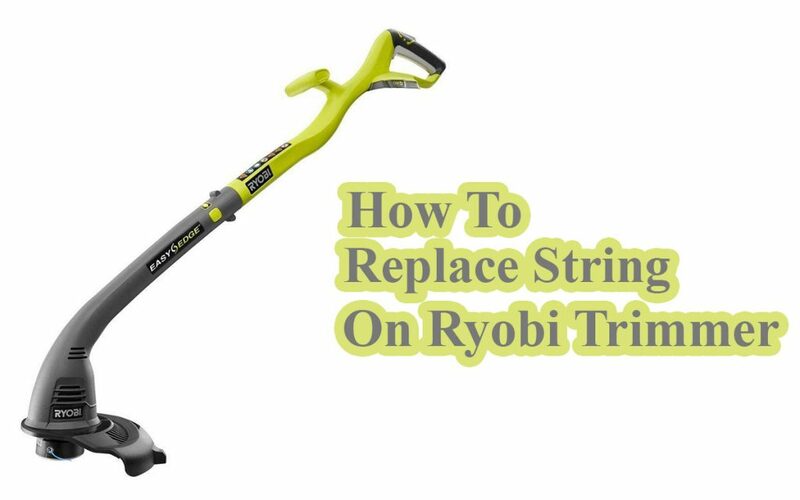 Let’s take a look at how to replace string on Ryobi trimmer for the three different heads. Make sure the machine is switched off and that it’s disconnected through unplugging it from the power outlet, disconnecting the spark plug wire or by removing its batteries. Cut a 25 foot long trimmer line from your string roll using a pair of scissors or utility knife. Move the knob of the head so the arrow sign lines up with the arrow signs on the head itself. Once that’s done, simply feed one end of the line through a hole that’s available on the head. Then pull the line from the other end to create two equal lengths. Keep winding the knob until about 8 inches of it are left. Note: For trimmers with curved shafts, it’s best to wind counterclockwise. Read More : Best Eyebrow Trimmer for Men & Women. As usual, it’s safety first. Begin by making sure the unit is properly turned off and disconnected from its source of power. Cut your string into two of 11-inch in length. Pick one of the 11-inch long lines and feed it into the hole on one side of your trimmer’s head. Keep pushing the line until it emerges on the other head of the head, about 1 inch of it. Be sure to remove any old string that might come out as you feed this new line into the system. Pick the remaining 11-inch length string and feed in the hole that appears on the opposite side of the head. Repeat the same procedure as you did with the first string. Make sure the engine of your Ryobi trimmer is stopped and disconnected from its power source when you start this. Begin by grasping the string head with your hand, unscrew the knob with the other by turning it anticlockwise. Once the knob comes out, pull out the old string. Get an 18-foot string trimmer, fold in half and then hook its center on the center of the spool. Once you hook it in place, wind both ends in the direction suggested on top of the spool. Be sure to leave some 6-inches of the line unwound. Gently return the spool inside the head while slipping each one of its ends into the holes provided. Turn the knob clockwise to fit it back into its place. Lastly, pull the string ends while pushing the spool down just to confirm that it works properly. As we have seen, replacing the string on your Ryobi Trimmer shouldn’t be a brainer. You only need to follow the right procedure for your specific type of head. Typically, you can get this job done in as few as 5 minutes.